What is cooler than a shiny, bright, powerful laser beam? Answer: nothing. In the movies, a laser is the ultimate special effect. 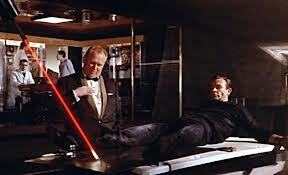 One of the first starring roles the laser beam had was opposite good old 007 in Goldfinger. Strapped to a table of gold, Bond, played by Sean Connery, had to find a way to escape the beam’s impending disastrous path (right down the mid-line of his body!). Since then, laser beams have made their way into numerous beloved films including Mission Impossible and Star Wars. It is forever etched in our minds, the moment when Darth Vader told Luke Skywalker (spoiler alert) that he was in fact, his real father, just after he lovingly cut Luke’s hand off with his shiny red laser beam. To this day, you can still spot children (or even some grown adults!) wielding a toy laser beam as if Jedi was in their job description. It never fails to amaze us the power that a single beam of light could have. Laser beams have come a long way since science fiction birthed them to life. Laser beams are not only of importance to secret agents and aliens, but Dr. Mark Green, a podiatrist with Kansas CityFoot and Ankle is now brandishing his own laser! That’s right. And you thought feet were boring! It’s called the Q-Clear laser. While powerful and amazing, this laser, unlike it’s movie counterparts, is not used to destroy enemies, only fungus. Its extraordinary ability is that it can banish toenail fungus in only one or two treatments. It works by emitting high energy shock-waves that destroy the fungus, but not the tissue of the foot. This laser is on the forefront of cutting edge technology and isn’t found in every office. You can, however, find it at Kansas City Foot and Ankle. Like all good lasers, it’s quick at its job. The in-office procedure takes just ten minutes and is painless. After the procedure, you can go back to your normal activities and shoe wear. Results are seen within two to four months. The Q-clear laser sets itself apart from other lasers on the market. For one, like mentioned above, it’s the quickest treatment option out there. Secondly, many other lasers produce heat that causes pain and burning. Not so with the Q-clear laser, as its mode of action is with shock-wave effects rather than heat. Prescription medications for fungal toe nails, on the other hand, can elicit several unsavory side effects. And comparing its level of effectiveness, the Q-clear laser destroys the over-the-counter competition. Nail polish and creams from the drug store just don’t get to the root of the problem. Who has time for that? Don’t let treating yellow, crusty, fungal toe nails become a chore. Call Kansas CityFoot and Ankle to learn more about the laser and set up an appointment today. May the force be with you! Call (816) 943-1111 – same day appointments are often available! When I think of turf I think of steak not toes!